This large format, stunningly illustrated book will probably make any young dinosaur lover roar with delight! 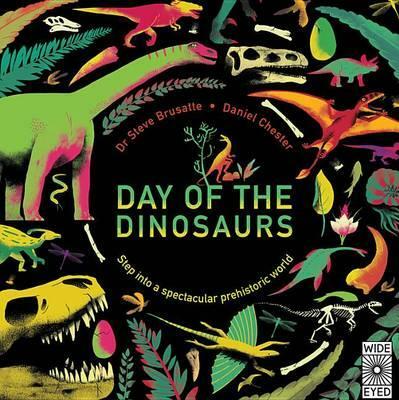 Divided into four periods — the Triassic, the Early-Middle Jurassic, the Late Jurassic, and the Cretaceous — Day of the Dinosaurs takes readers on a journey of discovery into how dinosaurs and other prehistoric animals lived on land, in the water and in the skies. The book begins with some words of advice. As you set off on this amazing adventure, you need to know that 'danger lurks around every corner'. There are three golden rules: 'always be alert, watch your back and try to keep your distance from the dinosaurs.' Then it's time to get started and meet the creatures of the Triassic! Field Notes appear throughout the book, giving snippets of information on the dinosaur diet and how they evolved to defend and attack. For example, the peaceful, plant-eating Plateosaurus had a sharp claw on its thumb that it could use to slash at attacking predators. When it wasn't defending itself, the same claw was useful for pulling down leaves and branches for it to eat. Close Up pages zoom in on a particular dinosaur, providing a detailed analysis of their unique features. Until now, I hadn't realised that — in comparison to crocodiles and lizards — dinosaurs had a 'grow fast, die young' approach to life. T. rex, for example, reached full adulthood by twenty but was dead by thirty! Contrast this with crocodiles who can live for seventy to a hundred years. This is another wonderfully entertaining and educational book from Wide Eyed Editions. The large format is the perfect size to do justice to the subject matter, and the high-quality paper will survive hours of small hands repeatedly turning the pages. A great reference for the school, library or home shelf.